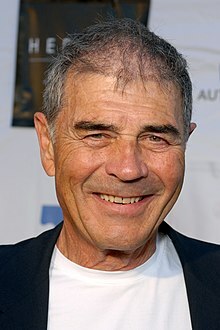 Robert Wallace Forster, Jr. (born July 13, 1941) is an American actor. He is best known for his role as Max Cherry in Quentin Tarantino's Jackie Brown (1997), which got him an Academy Award nomination for Best Supporting Actor. He is also known for his roles as John Cassellis in Haskell Wexler's Medium Cool (1969). Forster was born in Rochester, New York, the son of Grace Dorothy (née Montanarella) and Robert Wallace Forster, Sr., who worked as an elephant trainer for the Ringling Bros. and Barnum & Bailey Circus and later as an executive for a baking supply company His mother was Italian American, while his father was of English and Irish descent. The couple divorced in 1949. ↑ "Robert Forster Biography (1941-)". Film Reference. Retrieved 8 April 2014. ↑ "Robert Forster Biography". Yahoo! Movies. Archived from the original on 22 May 2011. Retrieved 8 April 2014. ↑ Klemesrud, Judy (4 June 1972). "Robert Forster – How To Succeed in Flops; About Robert Forster". New York Times. p. 11. Retrieved 18 December 2016. Voisin, Scott, "Character Kings: Hollywood's Familiar Faces Discuss the Art & Business of Acting". BearManor Media, 2009. ISBN 978-1-59393-342-5. Wikimedia Commons has media related to Robert Forster. This page was last changed on 25 August 2018, at 00:42.